Lola Barton’s life has been chaotic and uncertain. When she inherits a rundown plantation, she believes her life has finally taken a positive turn. But, when she finds a mysterious trunk in the attic, it takes her into the past and to a man with dark secrets—and she’s married to him. Joe Wilding carries his shame in his pocket in the form of a harmonica. The woman he thought he married to save her life, is beginning to break through his stoic wall and find the secret he hides. Loving her could be his ruin. Only time can tell. Her cynical mind told her the rumors that Misty Oaks Plantation had ghosts weren’t true. The tales of murder and betrayal had to be the overactive imagination of the local townspeople. A homeless vagrant had to be the most logical explanation for the disturbance. Once she gained the landing, she blew the cobwebs from the door and leaned her ear against it to listen for any movement on the other side. Wisps of harmonica music lifted in the air. Perhaps someone left a harmonica lying around and the wind blew hard enough through the cracks in the walls to make it sound as though someone played the instrument. Just the wind. No ghost. With her courage bolstered by her logical conclusion, she grabbed the doorknob and turned it. Mickie, thank you so much for having me on Blurbs And Blooms. You're welcome, Sarah. No doubt readers will enjoy Lola and Joe.s love story. Thanks for having me, Mickie. I hope readers care about Lola and Joe the same way I do. They became very dear to me--and started an entire series of Wildings. Sarah, you know how much I loved Harmonica Joe's Reluctant Bride! Time travel, I love, but your characters in this book are so realistic and go through a lot of hardship to be able to win their HEA! And look what this started! Your Wildings are dear to my heart, lady. I'm so glad you got them rolling with this wonderful novel. Cheryl, thank you so much for all your kind comments. I would have never guessed that Harmonica Joe would be the springboard for all the Wilding stories that followed. As you may remember, I had writer's block in the middle of this story. A fellow author told me I needed to love my hero with all my heart--and so I did. Once I truly cared about Joe, the story moved forward and I have loved him ever since. Thank you so much for taking time out of your extremely busy day to visit me here. Sarah, I will never, ever, forget this book. If I'm not mistaken, it's the one that started the whole Wildings phenomenon (yest, that is the right word). The settings, the characters, the emotional tones...everything worked in perfect harmony to produce one incredible story under your magical pen. I hope we'll be following Wildings for a long, long time to come. Kathleen, isn't it odd how we never really know what story will take root in the hearts of our readers? My grandfather's trunk inspired me to write this story, but I never would have imagined how deeply I cared about these characters and the Wildings that followed. It really warms my heart to see your encouraging and kind words about my story. I don't know that there will ever come a time when I won't have a Wilding story rolling around in my mind. 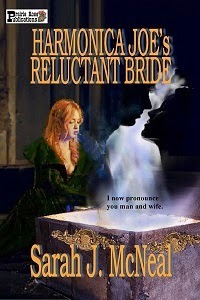 Sarah, I have Harmonica Joe's Reluctant Bride on my Kindle and look forward to start reading it this weekend. I know I will love it, because I just finished For Love of Banjo which tugged at my heart. I left you a review on Amazon and will do so for Harmonica Joe. I look forward to more books about this family. Keep them coming. Adorable Agnes, you have no idea how your kind words bolster me. When you read Harmonica Joe, you'll understand how much Banjo's life was changed by Lola and Joe Wilding and how his abandonment and difficult childhood could have ruined him except he has a spirit of courage and love. Thank you so much for your review of For Love of Banjo. I'll have to check it out. That was so sweet of you. I hope when you read Harmonica Joe he warms your heart and even makes you laugh. I appreciate your kindness and the encouragement your support brings to me. All the very best to you. Nice Excerpt. Makes me want to read more, that's for certain. C.A., thank you so much for that compliment. An excerpt is supposed to make an impression and a desire to know more, so it makes me happy that you said it made you want to know more. Thank you so much for coming. I always appreciate it when someone takes time to visit me on a blog or Facebook. It's heartwarming. I wish you the very best. This is a great story Sarah. Thank you so much, Connie. It's so kind of you to drop by and comment. I enjoy your work, too. Keep shining! Sarah, Truly enjoyed this story as well as For Love of Banjo. Your characters really come alive no matter which Wilding story. Did I tell you sometimes I'm leery of some paranormals? Well, not when comes to yours. Love them and can't put them done. Wishing you much continued success. Bev, it makes me so happy that you liked Banjo and Harmonica Joe. I can understand how you might be leery of paranormal stories. It's sort of a crap shoot if you aren't familiar with the author. Sometimes they can be weird or scary. Time travel stories are tricky. They have to be convincing--present a very important reason for the character to go back in time--something that will take the earth off its axis. And the transport to another time has to be believable and credible. Thank you for all your kindness, support and encouragement, Bev.